In a dramatic announcement on Monday, Feb. 4, Bennett College’s Phyllis Worthy Dawkins said she was confident that the Southern Association of Colleges and Schools Commission on Colleges would restore the historically black college’s accreditation. “We’ve raised enough to produce additional resources. That’s what we did – and more,” Dawkins said in announcing that the all-women’s school had raised $8.2 million, or $3.2 million more than the $5 million needed to save the accreditation. Students, alumnae and supporters cheered the news knowing that the college had met its Feb. 1 deadline to raise the funds. Fundraising efforts ended at midnight on Friday, Feb. 1 and officials spent the weekend and Monday tallying up the donations. Hopes ran high on Friday after High Point University announced that it was donating $1 million to Bennett, a total that at the time pulled the college to within a couple of hundred thousand dollars of the $5 million goal. High Point’s president, Nido Qubein, noted that High Point and Bennett are located near one another and both have roots in the United Methodist Church. 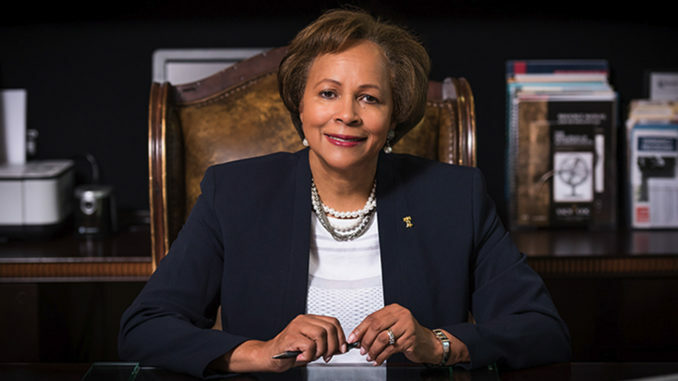 “Bennett College has an outstanding tradition of academic excellence for African American women,” said Dr. Benjamin F. Chavis, Jr., president and CEO of the National Newspaper Publishers Association, the trade organization that represents 215 African American owned newspapers and media companies around the country with more than 21 million weekly subscribers. “The college is funded by the Presbyterian Church and my great-great-great grandfather, the Rev. John Chavis, was the first ordained African American Presbyterian minister in the United States and so I appeal to all Presbyterians, to all Episcopalians, to all Methodists, to all Baptists, and to those of all faiths, to help save Bennett College,” Chavis said prior to the end of the fundraising effort.